A couple things happened this last week that brought Google+ to mind. While I like the system for sharing photos, there is little other that has really grabbed me to drive daily posts. The system is fine, and the folks at Google has brought together many features I enjoy on other systems. I post photos to gather people’s thoughts and share my thoughts on other photographer’s submissions. Google+ makes it easy to upload photos to folders or directly into posts. This week, Guy Kawasaki released a eBook “What the plus! Google+ for the rest of us“, and the Google+ iPhone app now provides a method for you to sync your photos automatically to a private folder online. Perhaps, I should expand on the last sentence. First, the Guy Kawasaki eBook. It is a relative fast read, but I found myself jumping back to make sure I had the information correct. 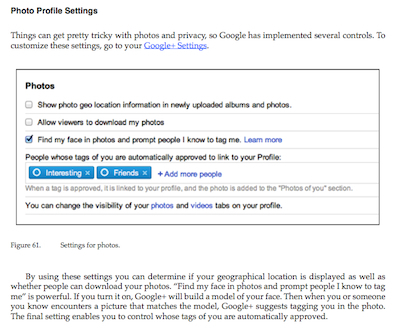 “What the plus…” is full of information about how to use the settings and features in Google+. It does a bit more though, it shows ways to use Google+. It isn’t a eBook on ‘getting rich with Google+’, rather it is about what you can do and what you shouldn’t do with the social service. It would appear that I should be a bit more pro-active in conversations with the folks I share a photography style passion with. Now for the Google+ iPhone app update. The iPhone app is free, currently there is no iPad version so on the larger iOS device you have to run it in 2x mode. The app allows you to add people to your groups, called ‘Circles’. You can put your thoughts up as posts and comment on other people’s posts. For photos, you can create folders to put them in, each with it’s own level of privacy/share. Also, you can insert a photo into a text post… which usually gets a lot more eyes and comments. About the time Apple got their PhotoStream working correctly with the iOS 5.1 update, Google+ has added ‘Instant Photo Upload’ to their app. This is a feature that was previously only supported in the Android Phone version. 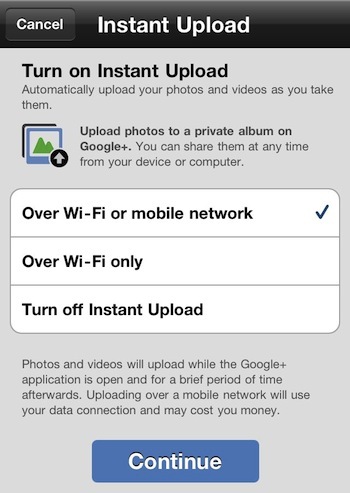 When it is on, the Google+ iPhone app will upload photos from your photo library in the background. Each time you start up the app, the sync will start moving your photos from your iPhone to a private folder on your Google+ account. There is a 1 gig limit, which I am researching if there is ways around. After you close the Google+ app by moving to another app, the sync of photos will continue for a short while. Keep that in mind if you jump to another app that needs Internet access and it is moving slower than expected. For me, having the sync feature turned on will make it much easier to share my iPhone photos with folks sharing theirs with me.